Barbara Joyce Bone Cody, age 83, of Wamac, Illinois, passed away at 10:25 A.M. on Tuesday, January 22, 2019, at her home in Wamac, Illinois. She was born on March 3, 1935, in her home in Centralia, Illinois, the daughter of the late John and Eunice Marie (Myers) Bone. She married Fred Steven Cody in July of 1962 in Centralia, Illinois, and he preceded her in death in December of 1998. 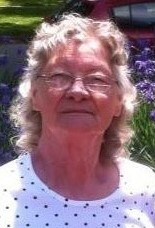 Mrs. Cody is survived by her daughter, Lisa Stanfield and husband Thomas of Centralia, Illinois; twenty three grandchildren, many great-grandchildren and great-great-grandchildren; brothers. Charles Bone and wife Sue of Centralia, Illinois, Robert Bone and wife Tyonia of Junction City, Illinois and William Bone and wife Pam of Springfield, Illinois; sisters, Judith Irvin and husband David of Centralia, Illinois and Deborah Boyce and husband James of Centralia, Illinois; brother-in-law, Kenneth Jones of Junction City, Illinois, and many nieces, nephews, great-nieces and great-nephews. In addition to her husband of 36 years, Mrs. Cody was preceded in death by her parents; son, Mike Cody, stepsons, Jerry Bob Cody, Sr. and Arvol Cody; stepdaughter, Katie Cody Pritchard; brothers, Infant Edward Eugene Bone and John Bone and sisters, Shirley Jones and Ruth Ann Carter. Mrs. Cody was of the Baptist Faith. She loved being in her garden and tending to her beautiful flowers. She enjoyed mowing her grass on her riding mower. She was an avid collector of family birthday cards, report cards and pigs. Earlier in her life, she enjoyed reading. Mrs. Cody is remembered as being one to stay at home with her dogs and cats throughout her life. She cherished the time spent with her family, especially her children and grandchildren, and did not miss any part of their lives. Mrs. Cody was a homemaker and housewife. She was also a landlady who looked after her rental properties. Earlier in life, she was a candy inspector with the Hollywood Brand Candy Factory in Centralia, Illinois. She lived in Wamac, Illinois since 1976 and formerly lived in Centralia, Illinois. Celebration of Life Services for Mrs. Barbara Joyce Cody will be held at 12:01 P.M. on Monday, January 28, 2019, at the Moran Queen-Boggs Funeral Home in Centralia, Illinois with Pastor Seth Baltzell officiating. Interment will follow in Hillcrest Memorial Park near Centralia, Illinois. Family and friends may visit with Mrs. Cody’s family from 10:00 A.M. until the time of services at 12:01 P.M. on Monday, January 28, 2019, at the Moran Queen-Boggs Funeral Home. Please view the online obituary, send condolences or share memories with Mrs. Cody’s family at www.moranfuneralhome.net or on the funeral home’s Facebook page.